The Halo: Reach Multiplayer Beta, also known as the Halo: Reach Beta, was a phase of the development of Halo: Reach, produced by Bungie, LLC and organized by Microsoft Game Studios. It is announced by the Halo: Reach Multiplayer Trailer posted on Bungie.net. The beta ran from May 3 through May 20, 2010. Although the beta only featured Machmaking and Theater modes, it introduced a variety of new features, such as expanded customization options, a "Credits" system for unlocking and purchasing armor pieces, and a new ranking system. Gameplay saw the introduction of Loadouts; when spawning, players can choose from preset combinations of starting weapons and Armor Abilities (a retooled iteration of Halo 3's Equipment) as well as spawn location (available only in select gametypes). In Matchmaking, instead of simply vetoing a map and gametype, players are now able to vote for their desired map and gametype from a short list presented in the Lobby. New gametypes were also introduced. Headhunter is a free-for-all gametype in which players must collect skulls dropped by fallen opponents and bring them to collection points. In Invasion, a team of SPARTANs must prevent invading Sangheili from stealing a data core. Generator Defense is a similar gametype in which a team of SPARTANs must defend three generators against Sangheili. Stockpile is a multi-flag gametype in which each team must bring neutral flags to their own collection points to score. These new gametypes along with existing ones made their debut upon the beta's May 3 release. Invasion and Generator Defense were introduced later on May 7 and May 14 respectively. An invitation to the beta was included with all new copies of Halo 3: ODST. Multiple invitations to the beta were randomly distributed to Xbox LIVE users by Microsoft as gifts for being loyal Xbox LIVE customers. In the few days before the beta, Bungie not-so-subtly gave out entire lists of beta codes which were quickly taken. 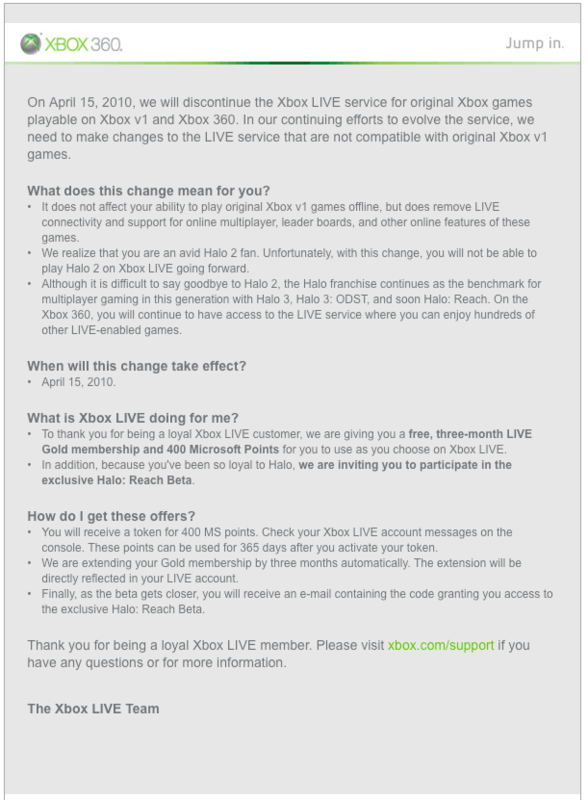 The beta required an Xbox LIVE Gold account to play Matchmaking. However, it was still possible for players to run the beta and customize their SPARTAN's appearance with only an Xbox LIVE Silver account. The playlist game type Generator Defense is a reference to Team Beta's mission during the Fall of Reach. Players who played the beta and then signed onto Halo Waypoint received an exclusive hoodie for their avatars. The beta was initially intended to end on May 19, 2010, but Bungie decided to push the end date by one extra day. During the beta's two-week run, over 2.7 million unique players played a total of over 6 million gameplay hours in the beta, making it one of the most played beta programs on any platform. Overall, there were over 1.1 billion kills registered in the beta. After July 21, 2010, Bungie stopped supporting stats and files from the beta. There were 117 days between May 20, the beta's closing date, and September 14, Halo: Reach's release date. If a player has played the Beta using their current Xbox LIVE account, they will unlock a Halo: Reach Beta Visual Flair, which is represented by an Assault Rifle icon in Halo: Reach. An assassination in the Beta. An explosion in the Beta. Mark VI as it appeared though a glitch in the beta. Mark V (B) as it appeared in the beta. Mark V as it appeared in the beta.